I wrote this article to share this low sugar, no pectin, simple cherry jam recipe. It's so easy, even I made it successfully! This is hard for me to admit, but I do not like making jams. I do not like canning, either. As a homesteader, aren't you supposed to know how to make and can jam? Isn't that one of the first things most homesteaders learn to do? Well, I have a confession: I try to keep my scratch cooking as easy and simple as possible. Canning seems, so....hard! And sweaty! Anyhow, as I look at what other homesteaders are doing to put up their preserves, I admit to feeling a little envious. Maybe even a little less like the homesteader I proclaim to be because of my dislike of canning and my suspicion that making jam will just take too much time.. Recently, we moved to a larger homestead with a little orchard, and in this orchard is a cherry tree! When you have a fruit harvest, you can't just let things go to waste, right? You MUST DO SOMETHING with the fruit. It's a mature tree, filled with hundreds of delicious cherries. One of my neighbors up here told me we'd better get out there and get those cherries picked before the birds ate them all up. So Mr. V. and I headed up to the orchard with our ladders. We ended up with nearly 20 pounds of cherries! And we didn't even get into the high branches.What on earth does one do with all these cherries? I'm originally from the desert, where cherries just don't grow. And the ones you buy in the stores were SO expensive. I LOVED cherry season in the early summer, and I ate as many as I could while they were available in the stores....but I didn't do anything else with them because of the expense. They are as costly as the rubies they resemble in the desert city where I lived, you see. But here? We had SO many! I ended up making a small batch of cherry mead, cherry vinegar, dehydrating about eight pounds of them, and then....I (big sigh!) decided I'd try my hand at jam. I found a recipe for low sugar and no pectin from Veena Azmanov, and I adapted it for the amount of sugar I was comfortable with. What I like about her recipe is that you don't have to can it, it requires a smaller amount of sugar than most jams, and you don't need to use pectin. Three great pluses! I actually reduced the amount of sugar even more, and it still turned out great. Here's my version of her Cherry Jam Recipe, and I think you'll love it as much as Mr. V. and I do! I may even become a converted jam maker after this! FTC Disclosure: There are affiliate links scattered throughout this article. If you click through and make any kind of purchase, I may earn a small commission at no extra cost to you. Full Disclosures Here. Click Here to Get the Free Newsletter & eBooks! What's the big deal about pectin, anyway? What exactly is pectin, I wondered? There are two main camps that are diametrically opposed in their beliefs about using pectin in making jams and jellies. The Pro-Pectin group believes that pectin is a must for making jam or jelly that is the perfect texture and consistency. This group also likes to state that "pectin is natural." The Pro-Pectin group also states that making jam or jelly without pectin causes an overcooked jam/jelly that turns out darker than it should. The Against-Pectin group believes that pectin is NOT necessary for making jam or jellies, and that with enough cooking and sugar, your fruit will gel just fine. Also, this group states that commercial pectin is usually GMO, especially since it contains dextrose which is derived from corn. It is also not usually organic, and the citric acid comes from highly sprayed fruits. Anyway, I thought I'd mention these things, because I was honestly wondering what the big To-Do was about pectin. Now you know. Personally, I'd rather avoid anything remotely unnatural, including GMO's, and I am a big fan of traditional cooking. Your grandma didn't use pectin to make jams and jellies, so I guess I don't need to either. This recipe yields a small amount of jam at the end. I ended up with a pint plus an eight ounce jelly jar of jam. I went small for this recipe because I didn't want to mess up a ton of cherries if I failed at this jam. If you are comfortable making jam, and you want more, just increase the proportions! I used a large, deep soup pot because the jam will boil up the sides (potentially), and you have to keep it stirred down. Not having had experiences with jam making (on my own) before this, I do feel the jam is darker than it would have been using pectin. However, I don't care about color. Look at those fresh cherries, right out of the tree! ** 2 pounds pitted cherries, chopped optional. I didn't chop my cherries. I pitted them first, though. I tried pitting them by hand, and I quickly realized that was NOT going to work with so many cherries. I bought a cherry pitter by YouTensil from Amazon, and I LOVE, LOVE, LOVE it! It worked like a charm! I used pounds of cherries for my measurement. You really need a kitchen scale to measure out your cherries, as some cherries are smaller or bigger than others. If I were to convert this amount to cups, I'd say there was probably about 5 cups of cherries, give or take. You can add more if you like a sweeter jam, but I just don't care for a lot of sweetness. I cut the sugar back as far as I thought I could and still have the jam set up ok. I am a terrible measurer. I eyeball everything. So, if you use more or less lemon, adjust to your own taste. The lemon helps to balance the sugar, as well as preserving the cherries. Here are all the ingredients. Isn't this easy? Step 1) Pit your cherries. You can cut them up if you want, but I like chunky spreads. So, I left my cherries whole. I have a feeling most folks would probably like smaller pieces, but I can't speak for others. Step 2) Combine all ingredients above in your large, deep stainless steel pot (acids will react with other metals). If you are increasing the size of this recipe, you'll probably want to use a stock pot. Step 3) Bring the mixture to a boil, stirring constantly. Step 4) Once it's boiling for a full minute, reduce the heat so it is simmering gently. Stir as needed to keep the mixture down, and also to be sure the bottom doesn't burn (yes, my bottom did burn a bit---so now I know this, I'll be stirring more than I did next time). You can see on the sides of the pan how high the jam bubbled before I got it down to a simmer. Step 5) Keep this up for about an hour to two hours. It took a little less than that to get a nice thick mixture. You can test your jam to see if it's done by using a spoon. The jam should "sheet" across the back of the spoon instead of dripping off in globs. Step 6) Once you like the thickness of your jam, let it cool for a few minutes. Then put it in your jars. If you want to freeze some, just choose Mason jars with the straight sides, like these jelly jars. Step 7) Refrigerate, freeze, or.....you can can them if you really want to! :-) I just put both jars in the refrigerator because I knew Mr. V. would be eating it right up! Enjoy! This recipe yielded a pint jar and an 8 ounce jelly jar of jam. Perfect for Mr. V. and me. You can increase the amounts if you want more! You know what? Sometimes I wish I liked sweet things more than I do. But this jam is SO good, and I like that it's not oozingly sweet, either. For me, it's perfect! I'm really glad I made the leap to try my hand at jam-making! I also wish I just loved canning. But...(sigh)...I don't. I prefer any other way of food preservation than canning. Don't get me wrong! I love seeing my jars lined up in the pantry just like the next homesteader. However, if I can ferment, dehydrate, brew, or freeze instead of canning; well I will. This jam is SO good! Maybe that will change someday? We will see. We are going to have a lot more to harvest this year than what I've been used to back in Nevada. Perhaps I'll surprise myself and turn into the Canning Genie! Anyway, I am chalking this cherry jam up as a success. It turned out really well, and next time I'll be making a lot more and yes--canning it too. 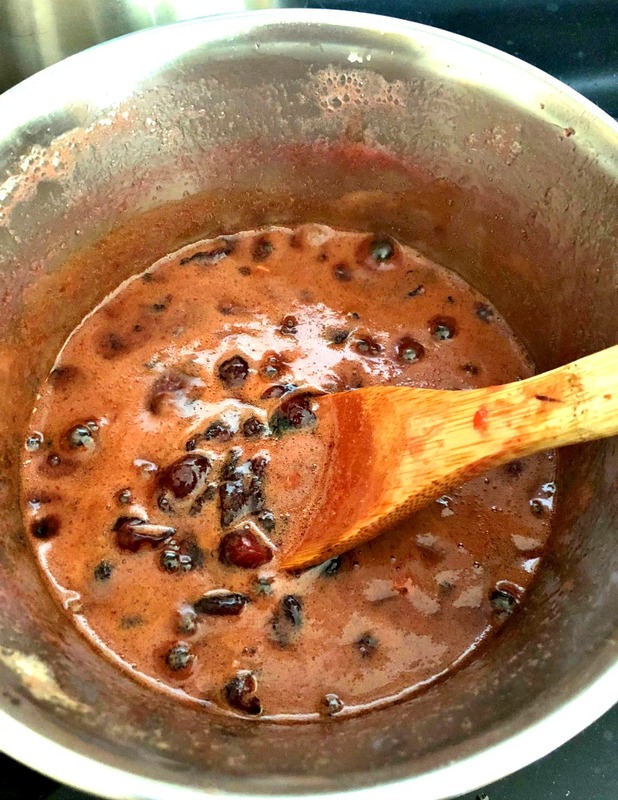 In fact, I am sure you can use frozen cherries for this recipe! That's on my to-do list for this winter when there are no more cherries around. Do you love or hate canning? Or maybe you are non-committal? I'd love to hear your thoughts on this topic. It's a point of shame for me, I admit---to not be overjoyed at spending hours in the kitchen canning. I'll be working on this! P.S. If you haven't signed up for our newsletter yet, I hope you'll do so! You'll never miss a thing and I'll be sending you three free eBooks! One is on how to use herbs for relaxation, another on essential oil blends, and the last one is about how to get your homestead started no matter where you live. Yummy cherry jam on toast!